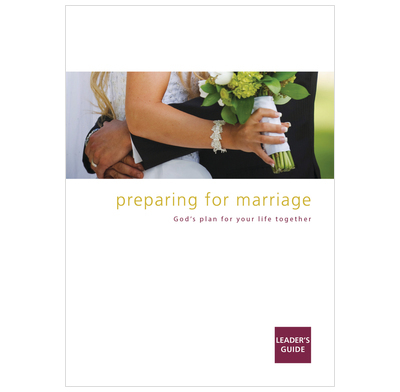 The Leader's Guide for the Preparing for Marriage course. The majority of people that get married in church, will have little or no knowledge of the Christian faith. Preparing for Marriage helps churches which are preparing couples for marriage reach out with the gospel to those who are lost without Christ. While not ignoring 'practical' aspects of marriage, Preparing for Marriage seeks to explain the gospel as the model for marriage. It also seeks to show that a relationship with God through faith in Christ is the very best basis on which to build a life. It is structured in four parts, and can be run in a variety of settings: by pastors and lay people. The downloads on the right are the talks as delivered by Pete Jackson. They may be suitable for you to put on CD to give to couples who are preparing for marriage. I have used this course in preparing couples for marriage for the last four years and find it to be superb on so many different levels. The evangelistic nature of the biblical material helps unchurched couples to think about the gospel and their marriage in church. For Christians it is really good at helping apply the Bible into an area of our lives where so often it can be forgotten. And finally, the questions are really helpful for couples thinking about their future married life together. They really do raise the issues, uniquely for each couple, that they need to think further about so that their marriage can be the best the it can be. I would highly recommend this course to anyone. This is a really helpful resource, and one that I use with all the couples I am going to marry. The way that marriage is rooted in the story of Creation-Fall-Redemption is massively helpful for helping people to understand both marriage and the gospel. And the questions are very helpful in getting couples to talk about themselves. However, I was in two minds about whether to give this three stars or four essentially because of the lack of balance in the course. It seems odd to criticise something for having too much of a focus on the gospel, but when a couple have come for marriage prep, that need to be what we give them, rather than something that uses marriage to talk about something else. At points (mostly in the fourth session) this is in danger of starting to head in that direction. There also could be more of a practical nature about how to relate within marriage - while there is some of this, that is mostly left for the couples to work out between themselves in the questions for discussion. This has the strength of not treating pragmatic advice as if it is on the same level as binding Biblical principles. What I do now is use the first three sessions, incorporating some of the material from session four into session three, over three weeks. I will supplement some of that with practical matters (so, for example, in week2 - when we look at the problems of marriage - I will talk with them about how to handle arguments). Also, each week we will look at an aspect of the wedding (since that needs to planned!) with the couple discussing that between sessions. So Week1 we will talk about hymns and music and they will go away with suggestions and come back with decisions in Week 2, when we talk about readings, and inn Week3 we look at the promises made in the service (which fits with the material in the book). This marriage preparation course is designed for ministers who are marrying unbelieving couples and goes with workbooks to be given out.. It is designed to run over 4 sessions and can be used either in one-to-one situations or in groups. It deals with the key issues without overcomplicating things. It has some useful discussion questions and lists some practical ideas. The gospel presentation is very clear and bold. My only criticism would be that I would have liked a better balance between the marriage counselling and the gospel presentation. The latter tends to dominate. I have searched for quite a while for something this good. It really helps the couples to open up and talk about the things they sometimes take for granted. It opens up opportunites to share the gospel of grace with couples and Can be used for any couple no matter what background. This is a great course as in four sessions it manages to combine some good marriage preparation with a basic explanation of the gospel. Each session takes an aspect of the gospel in sequence and then applies it to marriage. Couples with whom I have used it have consistently said how much they enjoyed it and how valuable it has been. It does seek to move people along quite quickly in spiritual terms; my only regret is that the final chapter is based on John 3v36 rather than, say, John 3v16, because I think the word "wrath" is a hard one for people to get their minds around at what is, for many, quite an early stage in their journey to faith - whereas "perish" in 3v16 is easier for people to grasp without cultural hackles rising so quickly. A good resource for anyone preparing couples for marraige. i shall be using it with couples from now on. A superb course that just hits the right note for the sort of couples I regularly marry (who have no meaningful church connection and aren't yet believers). Of course it needs adaptation to your own setting and style, but the theology and practical application is first rate. The couples I've used it with enjoyed it too! Terrifically useful in preparing sessions to talk to couples not only about marriage, but also about knowing God in the whole of life. We have used this material in preparing groups of couples for marriage. Usually a Saturday morning for sessions 1 to 3. Session 4 is done with each couple by themselves at a later date. Most of our couples are non-Christians and all have enjoyed the preparation sessions. We gave the copies of the booklets away, a number have re-read them and some are actively wanting to find out more. The course does not ignore the 'practical' issues of marriage, but these are left for discussion between the couples, so that the short talks simply share the Gospel message, starting off from the standpoint of marriage. To this end, we have supplemented the course by bringing in some Christian couples to answer questions and supplement the talks by showing how the Christian principles work out in practice.